We are so proud to announce that Over My Shoulder Foundation (OMSF) was recognized this year by the American Society of Interior Designers (ASID) New England Chapter. The recognition happened at the ASID New England Annual Awards Gala when a portion of the evening’s proceeds were donated to our mentoring efforts. This year, the Gala was thrown at the Mandarin Oriental in Boston’s Back Bay neighborhood on Thursday, March 21 (2013). ASID is the oldest and largest professional organization for interior designers. In the United States there are over 20,000 designers, industry representatives, educators and students committed to interior design through ASID membership. As Dawn Carroll, OMSF Co-Founder and Executive Director, guides this mentoring non-profit into its niche at events and awards (such as this year’s ASID New England recognition) we can’t help but notice that in the world of design, ASID is a top player. OMSF is heading in the right direction, and we hope you’ll get involved in our mentoring movement. 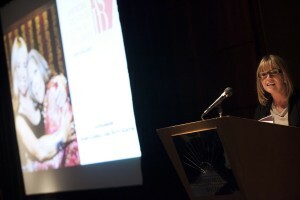 Here is Dawn accepting Over My Shoulder Foundation’s award at this year’s ASID New England annual awards gala. When Dawn accepted the award she talked about her experiences with mentoring throughout her career. 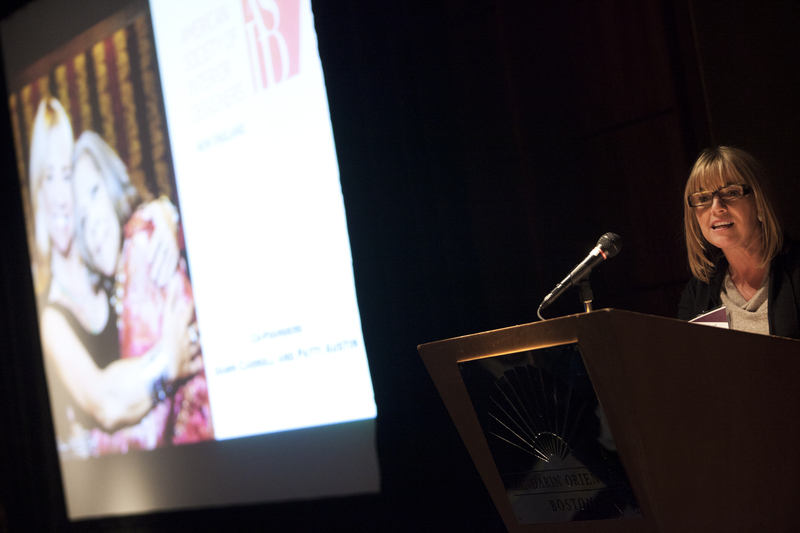 You can watch a video of the 2013 ASID New England Awards Gala here. As a stone designer at Cumar Marble and Granite, Dawn knows firsthand that in the stone world, mentoring is the only way that the special craftsmanship has been able to live on from generation to generation. With Cumar (a gold sponsor of the 2013 ASID New England Annual Awards Gala), which is currently in its 8th generation of leadership, Dawn is mentoring her OMSF Co-Founder Patti Austin in the world of design as Patti pursues her dreams of becoming an interior designer. Patti won the 2010 Mentors in Design award (the MIDDIE award was designed by Cumar) at the start of her involvement in design and commitment to mentoring. Someday Dawn and Patti might have their own design-centric mentoring TV show but until then, stay tuned. 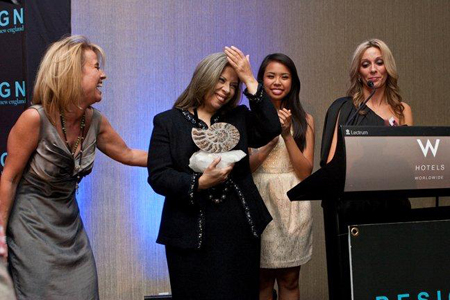 Here is Patti Austin, OMSF Co-Founder, receiving another design award, the 2010 MIDDIE (Mentors in Design) award. Ever at the intersection of mentoring, music and design – Over My Shoulder Foundation is set to take these worlds by storm and bring you into the magical world of mentoring. This year’s gold sponsor of the ASID New England Awards Gala is Mitchell Gold + Bob Williams. This powerhouse of design has supported OMSF’s mentoring movement through their Boston showroom. Just last year, Mitchell Gold + Bob Williams hosted an OMSF event in 2012 where OMSF Co-Founder and Grammy award-winning singing legend Patti Austin gave her mentee Santana Roberts a scholarship for National Thank Your Mentor Day. At the ASID Gala this year, ASID New England Chapter President Mary Beth Haggerty presented OMSF with a $1,000 check to expand mentoring efforts through music and design. Together, Dawn and Patti are bringing their vision to life. Over My Shoulder Foundation is using design, music, stories and entertainment to help people understand the power of mentoring and give them real life examples of how mentoring is an art form that deserves attention, recognition and effort.